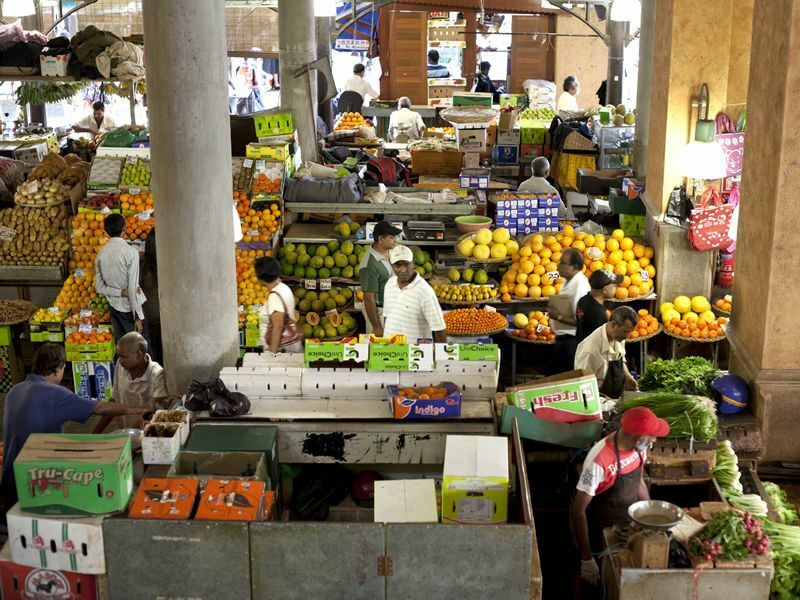 As I stood haggling under canvas in the heat of the day in Port Louis Central Market I suddenly realised how different Mauritius was to what I had expected. Staying in the Caudan Waterfront complex in the Mauritian capital meant I had on first glance a very different impression of this exciting city. Don’t get me wrong; if you ever find yourself in Port Louis the waterfront area is definitely worth a visit, with shops, restaurants and the Blue Penny Museum. But step out from this well manicured space and you will get a true taste of Mauritian life. I tapped numbers into the seller’s oversized calculator and we joked with him as I continued in my quest to get a good price for my souvenir pashmina and vanilla pods. With the deal done we shook hands and I moved on, weaving though the narrow walkways lined with colourful stalls of spices, clothing, shoes and jewellery. I really love to immerse myself in a new country and go where the locals go; I was definitely in the right place here. Around the next corner I found stalls of dried fish and other interesting looking but smelly provisions! After peering from a far I moved on fairly quickly not used to the unfamiliar smell that was wafting up my nostrils! Back on the main street I discovered a busy market building full of fruit and vegetables. I spent some time watching locals exchanging money and pleasantries and taking photos of the vibrantly coloured produce. I wondered further until I reached China Town, food stalls adorned the streets and herbal medicine shops full of weird and wonderful remedies caught my eye. An interesting fact I learnt while on this trip is that the Dodo was discovered in Mauritius and it was the only place this now extinct animal inhabited. It is thought to have become extinct in the late 1600’s. The bird can now be found on the Mauritian coat of arms and also on a lot of souvenirs around the island. Mauritius sits in the Indian Ocean, 1,200 miles off of the southeast coast of Africa. The main languages spoken are English, French and Creole. It is a multicultural island, with many influences including some from India and Africa. These influences spill over into the local cuisine; the Mauritians know how to make a good curry! This is one of my favourite dishes, so I was in heaven! The food is pretty cheap; I had a curry with naan, rice and a local Phoenix beer for around £10. I really recommend using the local currency, Mauritian rupee. I tried to pay for my meal with US dollars, which would have resulted in it costing double the price as in rupees. (I am not sure as to the reason behind this but I would definitely opt for rupees!) A swift night cap in the Keg and Marlin pub and I was off to bed for an early night ready for a boat trip I had planned the next day. If you get the chance you should go up to Signal Mountain to watch the sunset, this is not something I got to do but I was told that the views of Port Louis are fantastic. Jumping in a taxi early the next morning I was really excited for the day ahead. As we left bustling Port Louis behind busy roads turned into smaller lanes and the cityscape turned into a lush tropical landscape full of tea, sugar and pineapple plantations. The taxi driver was very enthusiastic pointing out areas of interest and eagerly stopping at points on the journey for us to take photos. Arriving at our destination I met my guides for the day and climbed onboard the small motorboat. As we left dry land the trip started well with beers pulled out of the cool box and sandwiches passed round. Skimming along the ocean the boat slowed down through a shallow part, as it did so a pod of dolphins appeared gracefully gliding through the water. What a lovely sight. Next it was time for a snorkel, I was really hoping to bump into the friendly dolphins but they had long moved on. Instead I settled for some colourful marine life and beautifully warm waters. A spot of lunch on the boat and a short journey along a jungley estuary with trees full of fruit bats bought us to a dramatic waterfall. It was time for a photo opportunity and the brave were allowed to dive in and explore the currents of the fast moving waters. The final stop of the day was the picturesque island of Ile Aux Cerfs. I loved how different this beachy paradise was to others that I have visited. The mangroves and sheltered shallow lagoon made a great place to cool down in, and after a short walk along the beach front I came to another part of the island where the current of the water was so strong you could jump in and be pushed all the way around and into the lagoon. There is still so much of Mauritius that I want to explore; this includes the world heritage sites of Aapravasi Gaht and Le Morne, Black River Gorges National Park, and Grand Bassin, a sacred Hindu lake. Along with many more beautiful beaches to bask in the sun on such as Flic en Flac, Tamarin, and Trou aux Biches. All this can mean only one thing - I am going to have to go back! Further reading: Check out the top 10 things to do in Mauritius, the so-named Paradise Island, a hotspot for honeymooners complete with swanky resorts, emerald-green sugar plantations, top-flight golf courses and underwater attractions.